Thelma Jones has had a long and illustrious recording career. She began singing while still a child with the family gospel recording group, The McDaniel Singers. 'Little David Play On Your Harp' and 'God Put A Rainbow In The Sky' were two recordings released at that time featuring Thelma as lead singer. Shen later moved to R&B when she recorded the original version of 'The House That Jack Built', along with 'Mr. Fix It', 'Souvenirs Of A Heartbreak' and 'Oh, Here Come The Heartbreak' for Barry Records. Her following realease was 'Salty Tears,' a great tearful ballad that really put Thelma on map. The self titled album 'Thelma Jones' was originally recorded for Columbia in 1978 (re-masterd and re-released in 2005), and contains Smokey Robinson's 'I Second That Emotion'. In 1987 Barry Records released the single 'Never Leave Me.' She has followed up with several more recordings, the last being the critically acclaimed CD 'Law Of Old' in 2002. As a live performer, Thelma has captivated audiences the world over with her electrifying vocal stylings. She is equally comfortable singing Gospel, Blues, Soul/R&B or Jazz. "It's the song that counts," says Thelma, "a good song is a good song in any genre." Thelma Jones' first brilliant album, released on Columbia in 1978, produced by Bert DeCoteaux with the addition of the Brad Shapiro-produced classic "Salty Tears." Thelma's soulful vocals are incredible -- very much in a traditional R&B mode; includes the first-ever U.S. liner notes by David Nathan. Two bonus cuts on this CD debut of this amazing album. Tracks: How Long; Stay Awhile With Me; Now That We Found Love; You're The Song (That I Can't Stop Singing); Love, Look What You Got Into Me; Salty Tears; I'd Rather Leave While I'm In Love; I Want What You Want; I'm Lonely Enough To Try Anything; I Second That Emotion; I Can Dream; Angel Of The Morning. CD by classic R&B and soulful diva best known for her Barry recordings ("The House That Jack Built", "Never Leave Me" etc.) and her much-treasured 1977 Columbia work. A blues-flavored album that features top class L.A. musicians and showcases Thelma's distinctive vocal style and includes one of her own compositions, the superb title cut. Tracks: Saved By The Blues, Law of Old, Get By Blues, Movin' On, Once And For All, All Tears Fall, Land Of The Jam, Don't Drop Me, Say Forever, My First Blues. CD by classic R&B and soulful diva best known for her Barry recordings ("The House That Jack Built", "Never Leave Me" etc.) and her much-treasured 1977 Columbia work. Close To The Ground is a Soul flavored album produced by Miss Thelma herself that features a powerful version of Midnight Train To Georgia and a hauntingly beautiful rendition of The First Time Ever I Saw Your Face. Tracks: How Sweet It Is, Baby I Love You, Angel Flying Too Close To The Ground, I Think You Made Your Move Too Soon, The First Time Ever I Saw Your Face, Up On The Roof, One Monkey Don't Stop No Show, Midnight Train To Georgia, Like A Phoenix. CD notes courstesy of SoulMusic.com where you can purchase CDs by many fine recording artists. 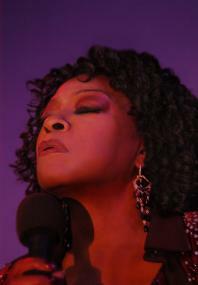 Go directly to The Soul Music Store: Thelma Jones to purchase CDs by Thelma Jones. 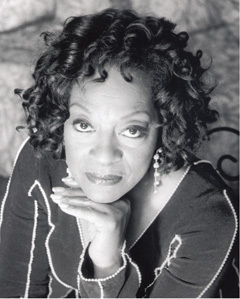 Thelma Jones has numerous earlier albums credits as she has been on dozens of compilation CDs. There is a brisk underground music trade in her older recordings as evidenced by simply typing her name in on Ebay. Following are a list of some of the Barry and Columbia Records singles that were released for radio play. David talks about his long friendship with Thelma and gives a brief history of her of recording career along with some insights from Themla herself. Black & White shot by Tracy Scroggins.